Uncapped Ulster duo Iain Henderson and Luke Marshall have been included in a 33-strong Ireland squad for a two-day training camp. 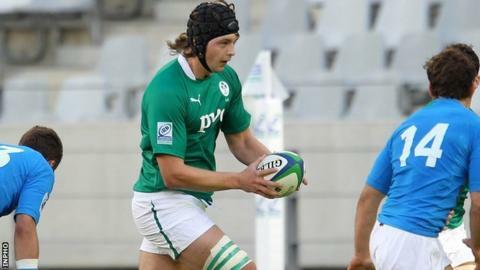 Former U20 international Henderson impressed in the recent Junior World Championship while centre Marshall is an emerging talent with Ulster. Munster forward Dave O'Callaghan is the third uncapped player in the squad. Paul O'Connell, Stephen Ferris, Tom Court and Tommy Bowe return after missing the summer tour of New Zealand. There are also some players who played in June but who are sitting out this camp due to minor injuries or to finish off their pre season, including Rob Kearney. Luke Fitzgerald and Sean O'Brien are among long-term absentees. A further squad will be announced for the Guinness Series in late October following the completion of the second round of the Heineken Cup. "At this stage of the season it is about building foundations for the Guinness Series and it is vital to get the players together to do that," said Ireland coach Declan Kidney. "A number of them have yet to play, but it was important to include some of them from a positional sense for this camp, such as Paul (O'Connell) and Rory (Best), as well as other players who missed the summer tour. "There are a number of players who are not included due to injuries and will continue their rehab and their preseason work in their provinces. "However, with more playing time and a lot of high level games to come, there is certainly time for them to push for their inclusion in the Guinness Series squad and selection for the games in November." Ireland squad: Rory Best (Ulster), Tommy Bowe (Ulster), Darren Cave (Ulster), Tom Court (Ulster), Sean Cronin (Leinster), Gordon D'Arcy (Leinster), Keith Earls (Munster), Stephen Ferris (Ulster), Declan Fitzpatrick (Ulster), Cian Healy (Leinster), Jamie Heaslip (Leinster), Iain Henderson (Ulster), Chris Henry (Ulster), Denis Hurley (Munster), Luke Marshall (Ulster), Conor Murray (Munster), Mike McCarthy (Connacht), Fergus McFadden (Leinster), Kevin McLaughlin (Leinster), David O'Callaghan (Munster), Donncha O'Callaghan (Munster), Paul O'Connell (Munster), Brian O'Driscoll (Leinster), Ronan O'Gara (Munster), Peter O'Mahony (Munster), Eoin Reddan (Leinster), Mike Ross (Leinster), Donnacha Ryan (Munster), Jonathan Sexton (Leinster), Andrew Trimble (Ulster), Dan Tuohy (Ulster), Damien Varley (Munster), Simon Zebo (Munster).